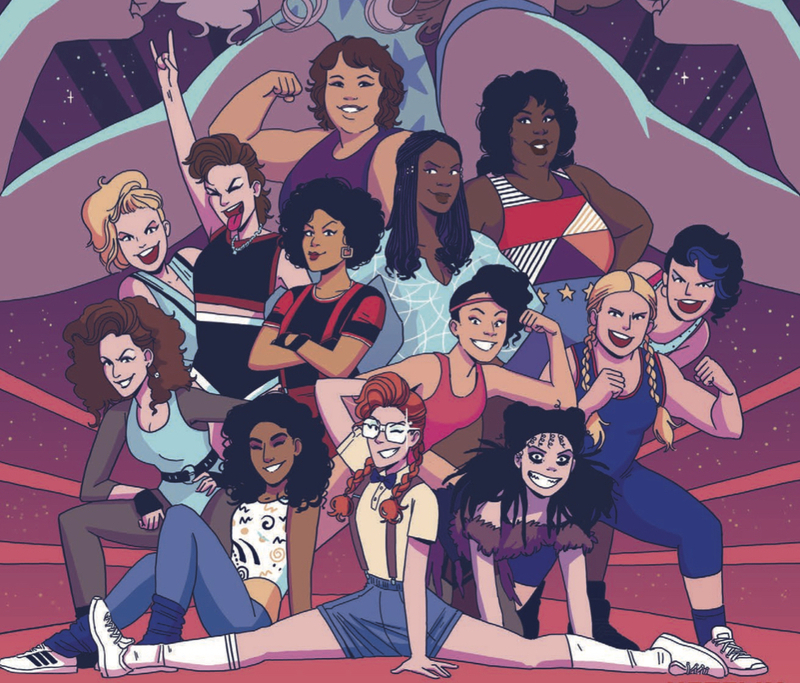 GLOW #1 Review – AiPT! The women of GLOW are excited to find out they finally have a weekend off from their shooting and rehearsal schedule. Naturally, their manager has different plans: the Gorgeous Ladies are heading to Reseda Wrestlefest! This is an odd example of a tie-in comic that worked rather well for me as a companion to the series it sprang from, but may have quite a few obstacles in its way when it comes to standing on its own. This first issue doesn’t spend any time introducing the characters or their stage personas. This story might as well be taking place between episodes in season two, when the audience is already familiar with everyone. The comic attempts to subvert this problem with a “casting call” in the back of the book, which tells us who each of the characters are. While it’s a neat idea to put this in the back of the book (almost like a pin-up gallery), one can’t help but feel like this would better serve the book — not to mention the reader — if it were up front. This isn’t particularly helped by the fact that all we get in this “casting call” page is the characters’ names and stage names, but not much else in the way of context. Again, this isn’t a huge drag if one is familiar with the TV show, but this reading may not be a smooth read for the uninitiated. Writer Tini Howard has a firm grasp on the rhythm of the Netflix show’s dialogue. Translating that tone to the page must have been difficult, but Howard is pretty successful in that effort right out of the gate. In particular, it’s easy can hear Marc Maron’s voice delivering Sam’s dialogue in this issue. The artwork by Hannah Templer and colors by Rebecca Nalty are lovely. The characters are all slightly cartoony, but with completely expressive and unique faces. Templer’s work here reminds me of the issue of Jem and the Holograms: Dimensions that she illustrated. I love that book and — no offense intended to any of the other wonderful artists who have worked on Jem-related books — I found her art style to be the most appropriate match for that property since Sophie Campbell’s issues early in the main Jem series’ run. The ’80s glam flair created by combining Templer and Nalty’s abilities is a (wrestling) match made in heaven, perfectly suited to this series. All in all, this was a fun first issue. My few gripes have mostly been covered, mainly the accessibility for new readers. Even as a fan of the show, I found myself double-checking to make sure I remembered which character was which. This isn’t a failure on the artist’s part; it had just been a while since I’ve watched the show. It’s a little vague when this series is supposed to take place during the series, but that’s probably purposeful. This book looks to be taking the characters and the personalities we are familiar with and telling side-stories involving them. It takes place in a slightly more heightened reality than the one in the series, a little more in-line with the early episodes of the Netflix show when it was finding its voice (fans of the show will likely recall the cocaine robot that came out of left field). This is a good choice for the comic, because it can tell stories that probably wouldn’t be attempted in the show. This is, after all, the main goal of most comic book tie-ins. They don’t have to fuss over a budget or stunt crew for their set pieces. I already love these characters — now I’m just looking forward to seeing what this series can really do with them.